Reconstruction of facial defects is a challenging endeavor. Successful reconstruction requires a thorough understanding of skin anatomy and physiology, careful analysis of the defect, thoughtful consideration of multiple options for donor tissue, and skillful and meticulous soft tissue–handling techniques. Options for reconstruction are generally classified using the “reconstructive ladder,” proceeding from least invasive to most invasive in terms of morbidity. At the bottom of the ladder is secondary intention healing in which defects granulate over a period of weeks in a moist, semi-occlusive environment. 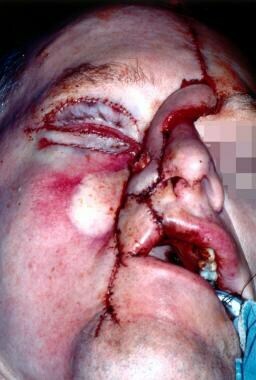 Other options for facial reconstruction include grafts, local flaps, and free tissue transfer. When planned and executed properly, local skin flaps allow for rapid reconstruction with a reliable and adequate blood supply and a good skin color/texture match. The goal of this section is to outline the use of local skin flaps for facial reconstruction. The subunit principle is well recognized as the starting point in the analysis of facial defects (see the image below). With the subunit principle, skin color, texture, and thickness, as well as hair growth and surrounding contours at subunit junctions are considered; these features can provide optimal camouflage for incisions and transition. 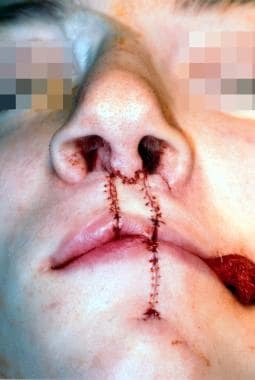 The subunit principle is only a starting point, but it is the foundation for adequate reconstruction of facial defects. No single flap is optimal for every defect. Each defect must be individually analyzed for depth, distortion of surrounding subunits, and normal tissue available for reconstruction. On the basis of this analysis, the appropriate flap or combination of flaps is chosen. Facial plastic and reconstructive surgeons must be aware of the entire armamentarium of local flaps so that they can more easily visualize the various combinations of flaps and predict their success. Mastery of the use of local flaps requires the ability to predict long-term results and anticipate inevitable scarring and contracture. The microcirculatory system of the skin is composed of the deep vascular plexus at the junction of the subcutaneous fat and reticular dermis and the superficial plexus in the superficial dermal papillae in the papillary dermis. The superficial plexus of capillaries supplies the more metabolically active epidermis by means of diffusion. Parallel to the skin surface, the 2 dermal and subdermal plexuses are supplied through numerous collaterals. These, in turn, are supplied by deeper septocutaneous and musculocutaneous arteries, which are perpendicular to the skin surface. This network provides a redundant rich source of blood supply to the skin. Both the sensory and the sympathetic nervous systems innervate the skin. The sensory nerves are distributed in a segmental fashion. The sympathetic nerves control the arteriolar preshunt sphincters and are mediated by the release of norepinephrine. Incisions at the borders of the flap interrupt the parallel superficial and deep cutaneous plexuses, inevitably resulting in decreased perfusion pressure to the skin. Sympathetic nerves are severed; as a result, norepinephrine is released from the nerve terminal and catecholamine reuptake is eliminated. This surgical sympathectomy further decreases the blood flow to the flap. Many physiologic factors affect flap survival, but the common denominator involves 2 basic factors: (1) blood supply to the flap through its base and (2) formation of new vascular channels between the flap and the recipient bed. The surviving length of the random portion of a skin flap depends primarily on the perfusion pressure of the supplying blood vessels. In the past, random skin flaps were thought to have a strict numeric length-to-width ratio: the wider the base, the longer the flap. However, if the wider base simply involves additional vessels with the same perfusion pressure, the length of surviving flap is unaltered. 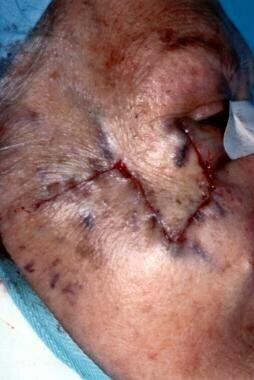 Neovascularization of the flap usually develops 3-7 days after transfer. This vascularization occurs through 2 processes, namely, direct ingrowth and inosculation. With an angiogenic stimulus, the vessels at the edge of the flap become dilated, and the basement membrane thins considerably. Endothelial cells then migrate from the adjacent vascular lumen toward the vascular stimulus. Behind the advancing front of migrating endothelial cells, endothelial cell replication leads to the formation of a capillary sprout, which elongates toward the angiogenic source. 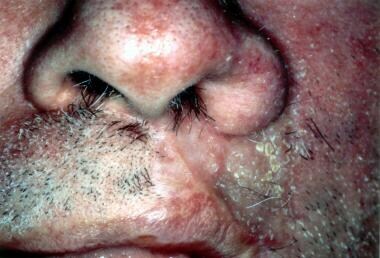 Nearby capillary sprouts form anastomoses with each other, forming capillary loops and then new blood vessels. Inosculation refers to direct ingrowth of surrounding recipient capillaries into preexisting vessels in the flap. Certain clinical scenarios worth noting call for reconstruction with flaps that have been delayed. Although a detailed description is beyond the scope of this article, the delay phenomenon alters flap vasculature and results in a reorganization of the vessels along the long axis of the flap. Choke vessels become dilated, and the zone of necrosis is shifted toward the tip of the flap. Vascular endothelial growth factor seems to play a role in this phenomenon. Surgeons must be familiar with the vascular supply of a local flap, either random (supplied by the dermal and subdermal vascular plexuses) or axial (supplied by a named artery and vein). 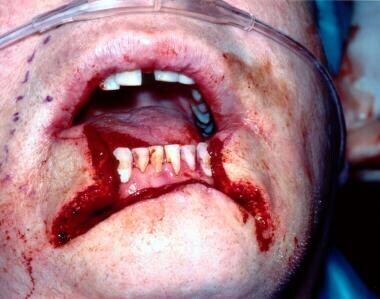 Most axial flaps have some random blood supply at their distal ends. Efforts for simplifying the classification of local flaps according to sliding or lifting tissue movements are applauded; however, for teaching purposes, the authors prefer to classify local flaps according to classic transfer methods. In reality, as discussed in the section Reconstruction of Specific Facial Subunits, many local flaps actually are combinations of these classifications. Flaps include advancement, pivotal, transpositional, rhombic, and bilobed flaps. If the flap is long enough, the principle of halves can be used to evenly distribute the relative excess in length and to use sutures to eliminate a standing cone. Bilateral z-plasties may be performed at the base of the flap, provided that the pedicle is wide enough to support the length of the flap. An island advancement flap is a special type of single-pedicle advancement flap. The skin island is designed to match the defect and is incised through only the dermis to preserve the underlying subcutaneous tissue. As the skin island is advanced into the adjacent defect, the subcutaneous pedicle is preserved, and the donor defect is closed in a V-Y fashion. These flaps are designed to allow advancement into the adjacent defect in a vector that is perpendicular to the flap axis. These flaps are generally used to close a defect in an area of high visibility by moving the defect into an area of low visibility (eg, from the forehead to the scalp). Bipedicle advancement flaps are used infrequently because simpler more aesthetically favorable options for reconstruction usually exist. Pivotal flaps are moved about a pivotal point from the donor site to the defect. Pivotal flaps include rotation, transposition, and interpolation flaps. 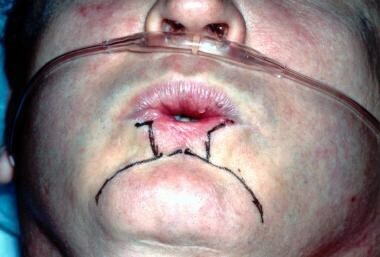 Planning for a cervicofacial rotation flap is shown. The length of the flap should be larger than the defect by a 4:1 ratio. Clinical photograph of a rotation type of pivotal flap. Z-plasty (see the first image below) is a technique of creating 2 transposition flaps with identical angles to the direction of the defect and transposing them in opposite directions. This technique has many applications in facial reconstruction. Z-plasty is used to lengthen a contracted scar, change the direction of the scar into a more favorable orientation (ie, along RSTLs), and/or interrupt scar linearity (see the images below). A - Diagram of planning for a z-plasty. Base view, planning for z-plasty. 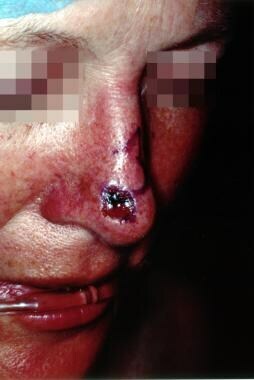 Z-plasty after transposition and closure of the flaps. The interpolation flap is similar to the transposition flap in that the flap is moved about the pedicle and transposed across intervening tissue; however, with an interpolation flap, the pedicle rests over the intervening tissue. The pedicle must be divided and inset at a second stage after neovascularization occurs. A common interpolation flap is the forehead flap. Limberg originally described the rhombic flap (see the images below), which is a specially designed transposition flap used to correct a rhombus-shaped surgical defect. The classic rhombus defect has sides of equal length, with 2 opposing 60° angles and 2 opposing 120° angles. This configuration creates a short diagonal (which bisects the 120° angles) of the same length as that of the sides of the rhombus. The configuration of a rhombic flap creates a short diagonal (which bisects the 120° angles) of the same length as that of the sides of the rhombus. Rhombic flap after transposition and closure. Every rhombic defect has 4 potential closure flaps. To determine which flap is optimal to close a particular defect, the lines of maximum extensibility (LMEs) surrounding the defect first must be determined. 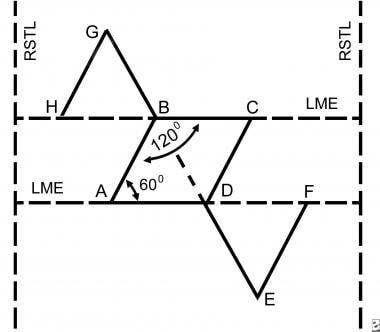 The LMEs are oriented perpendicular to the RSTLs. Two parallel lines are drawn along the LMEs and adjacent to the defect. Two additional parallel lines are drawn to create the 60° and 120° angles. The short diagonal is then extended by the length of the sides of the rhombus. A cut is made from each of the 2 extensions of the short diagonal back to the lines along the LMEs and parallel to the sides of the rhombus. Thus, 2 flaps are created, and the surgeon must determine which best matches the skin and camouflages the scar. The Dufourmentel flap is a variation of the classic Limberg rhombic flap. This flap is designed to close rhombic defects with any 2 opposite angles rather than the 60° and 120° angles. The bilobed flap, shown in the images below, is another variation of the transposition flap. The flap is actually 2 transposition flaps that share a common pedicle. The first transposition flap is used to reconstruct the defect, and the second flap is used to repair the donor site for the flap. The angle between each flap is 90°, with a total transposition of 180°, which frequently causes standing cone deformities and increases the likelihood of pincushioning. Zitelli introduced a modification to reduce the standing cone deformities and pincushioning. This modification reduces the angles between the flaps to 45°, limiting the total transposition to approximately 90°. The key to the success of the bilobed flap is the distribution of tension over both limbs of the flap. Diagram of planning for a Zitelli modification of bilobed flap. The caudal margin of the defect should be at least 10 mm from the nostril margin. Clinical photograph of planning for a Zitelli modification of a bilobed flap. Wide undermining is required for tension-free transposition during a Zitelli modification of a bilobed flap procedure. A Zitelli modified bilobed flap is set, with closure of the donor site for the secondary flap first, closure of the secondary flap, and then closure of the primary flap. Final closure of a Zitelli modification of a bilobed flap. In designing the flap, one must consider the tissue elasticity, potential deformation of surrounding structures, and RSTLs. Not infrequently, dermabrasion is planned as a second stage to minimize scarring associated with this flap. For a bilobed flap, the upper limit in size of the defect is approximately 1.5 cm. The bilobed flap works best with defects involving the lower third of the nose, namely the ala and the tip. The major criticisms of the bilobed flap are that the scars created in designing the flap are difficult to camouflage in the RSTLs, and also that a simpler flap can sometimes be used with a better aesthetic outcome. Choosing the optimal reconstructive method for a specific defect is a complex process. Generally, reconstruction should be accomplished with the simplest effective method possible. Rather than discuss the entire reconstructive ladder for each defect, certain flaps are described, with pertinent pearls and pitfalls. Before deciding on the flap, draw the surrounding subunits, including and adjacent to the defect. 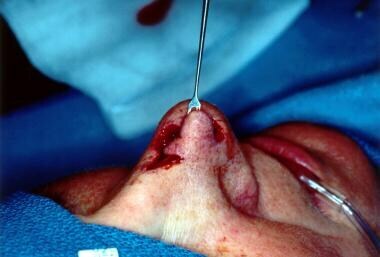 Close the donor site for the flap before the flap is sutured in position. This maneuver decreases tension on the flap and makes closure easier. Because of its prominent position on the face, the nose is commonly injured in trauma and burns. When properly executed, adherence to the principle of separate 3-layered reconstruction of full-thickness defects generally preserves function and minimizes the effect of contraction. The effect of scar contracture is most prominent at the nasal alar subunit and can cause major deformity and nasal airway obstruction. The nasal subunits provide a good foundation for planning reconstruction. A general rule is that if more than 50% of the subunit is removed, all of the subunit should be removed for optimal camouflage of the reconstruction. 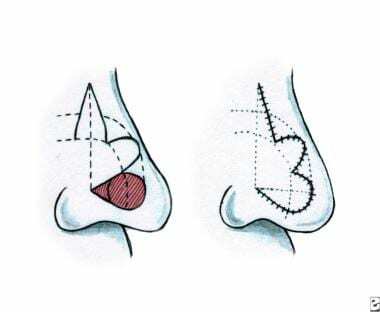 In general, defects of the superior two thirds of the nose that involve the dorsal and/or sidewall subunits are reconstructed with thinner, less sebaceous skin than that used in the inferior third of the nose. 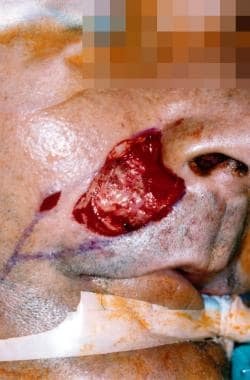 The paramedian forehead flap (interpolation flap) provides abundant tissue, with excellent color and texture matching, and it can reliably be used to resurface the entire nasal surface (see the images below). This flap is axially oriented relative to the supratrochlear artery, which travels superiorly in the subcutaneous-subdermal plane from a point 1 cm above the level of the eyebrow. In practice, the flap can be designed with a 12 mm pedicle based on the medial clubhead of the brow. Diagram of paramedian forehead flap for resurfacing the entire nasal surface. 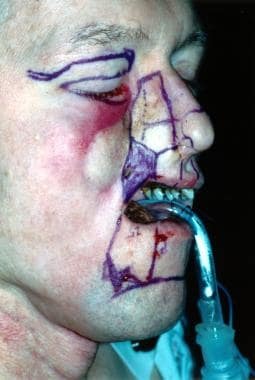 Clinical photograph of planning for a paramedian forehead flap to provide an external lining in a total nasal reconstruction. The paramedian forehead flap has been raised and thinned prior to insetting. The paramedian forehead flap has been inset, and the donor site has been closed, with a small area to heal secondarily. Ipsilateral flaps are usually used for ipsilateral defects in order to gain a bit of length and avoid having the pedicle stretch over the nasal dorsum. Differential sculpting of the undersurface of the flap to match the contours of the defect allows great flexibility in the use of this flap anywhere on the nose. The major disadvantages of the flap are the vertically oriented forehead scar and the limited length in non–hair-bearing forehead skin. 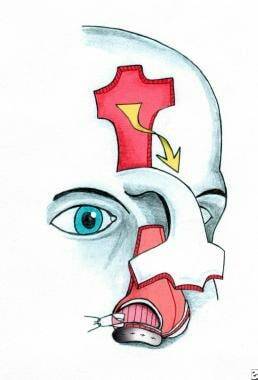 Another option in the reconstruction of defects of the middle third and junction of the middle third and lower third of the nasal dorsum is the dorsal nasal flap, or Reiger flap. Marchac describes modification of the flap, defining an axial pedicle for the flap based on the angular artery. This modification creates greater flexibility and a more reliable blood supply. The lower third of the nose, with its complex contours and thicker, more sebaceous, and less elastic skin, is more challenging to reconstruct. For defects smaller than 1.5 cm in the greatest dimension, the Zitelli bilobed flap, when properly designed, is an excellent flap (see the images below). Defects less than 10 mm from the lateral alar margin should not be reconstructed with the bilobed flap because this procedure can result in notching and retraction of the ala. When the entire tip subunit requires reconstruction, the authors prefer to use a paramedian forehead flap. For subtotal tip defects, a full-thickness skin graft or composite auricular skin/perichondrium/cartilage graft is another option. The alar subunit requires cartilage support between the internal and external linings to prevent upward contracture. If the defect is confined only to the alar subunit, the best choice of local flaps for the external lining usually is a melolabial flap. 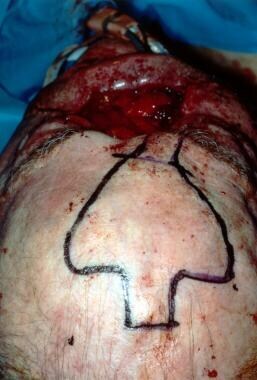 If the defect includes the adjacent tip subunit, a paramedian forehead flap is often the best choice. 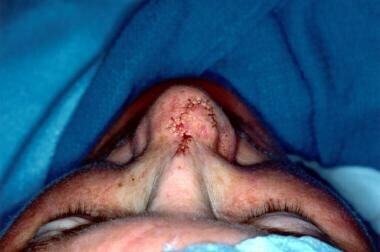 A frequent reconstructive problem is scarring across the alar-facial crease or along the cheek/nasal sidewall junction. 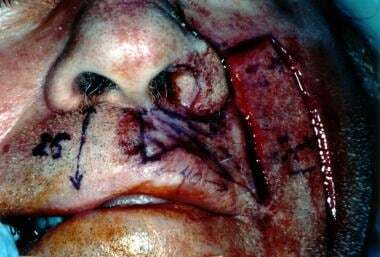 This problem is most easily and successfully reconstructed with a well-planned Z-plasty (see the images below) or a laterally based cheek advancement flap into the alar-facial crease combined with a forehead flap. An unusual variant of Klippel-Trenaunay syndrome involving the upper extremity. 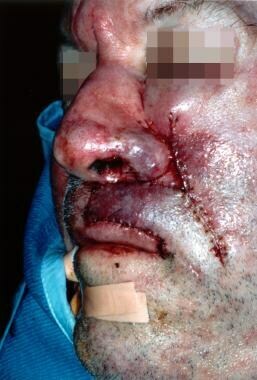 Clinical photograph of a z-plasty to reconstruct a nasal-facial web. Cheek defects are complex because of their depth and the difficulty in adequately matching the contour of the surrounding tissue. The skin of the cheek is relatively thick and has good elasticity. In elderly patients, great laxity and redundancy is usually present; therefore, primary closure along RSTLs is the simplest and best reconstructive option for small defects. However, for medium-to-large defects, local flap coverage is required. Rhombic and other simple transposition flaps can be used with some success in the cheek, but care must be taken to avoid placing incisions perpendicular to the RSTLs of the cheek. These flaps are generally limited to the lateral aspect of the cheek and to the superior aspect of the cheek near the lower eyelid. Planning for an island pedicle flap to reconstruct a defect created at the alar-facial junction. Result of reconstruction with an island pedicle flap 1 month after closure. The upper and lower lips are the focal points of the lower part of the face. Goals of lip reconstruction include maintenance of oral competence, including both motor and sensory innervation and preservation of an adequate gingival-labial sulcus without distortion of surrounding structures. The first step in reconstruction is consideration of the complete sphincter formed by the orbicularis oris muscle, which is the foundation for lip reconstruction. If restoration of the complete sphincter is unattainable, reconstruction of the lower lip takes precedence because the lower lip is slightly more important to oral competence; that is, the upper lip functions more like a curtain, while the lower lip functions more like a dam. Reconstruction of the red lip should involve tissue from the red lip or buccal mucosa. Small defects are repaired with V-Y advancement flaps or Z-plasty. Larger defects may require vermilionectomy with buccal mucosal advancement. Small full-thickness (< 40%) or partial-thickness scars of either the upper or lower lip should generally be excised and closed by using primary closure that follows the radially oriented RSTLs. Avoid notching of the lip, which is common with the traditional V-shaped wedge excision. Every attempt should be made to avoid extension of flaps into or through the borders of the lips (ie, the melolabial folds and labiomental crease). Larger partial-thickness defects of the upper lip are generally reconstructed best with inferiorly based melolabial flaps (see the images below). One disadvantage of these flaps is that they efface the melolabial crease. Secondary creation of a crease helps to redefine normal contours. 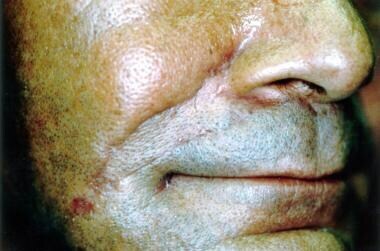 Contracted scar from a previous attempt to reconstruct the upper lip. 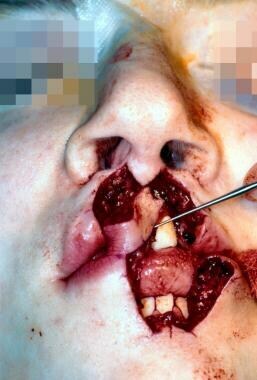 Planning for reconstruction of the upper lip lateral subunit with an inferiorly based melolabial flap. Insetting of an inferiorly based melolabial flap and closure of the donor site. Full-thickness defects involving more than 40% of either the upper or the lower lip generally require a 2-staged lip flap, namely, a Karapandzic, Abbe, or Estlander flap. All 3 flaps transfer functional orbicularis oris muscle. The Abbe and Estlander flaps are pedicled lip-switch flaps in which the pedicle must be divided, usually 3 weeks after interpolation. The Karapandzic flap is an advancement rotation flap with arterial and nervous supplies. The incisions are created to produce bilateral skin/muscle flaps, which are left attached to the underlying oral mucosa. The flaps are then advanced and rotated medially and sutured together to reconstruct the defect. The patient must be prepared for secondary commissuroplasties because of the inherent microstomia created with the use of the Karapandzic flap (see the images below). Planning for a Karapandzic flap to repair a contracted scar from a previous attempt to reconstruct the central part of the lower lip. 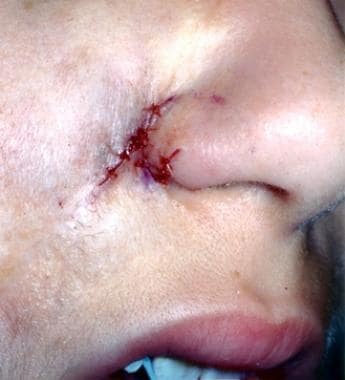 Incision along the mentolabial crease after full-thickness removal of scarred lip as part of a Karapandzic flap procedure. Individual closure of all 3 layers to complete a Karapandzic flap procedure. The Abbe flap is used to reconstruct defects in the opposite lip and consists of a full-thickness segment of the central part of the lip with a pedicle on the vermilion border to include the labial vessels. For most defects, the flap is half the size of the defect (see the images below). 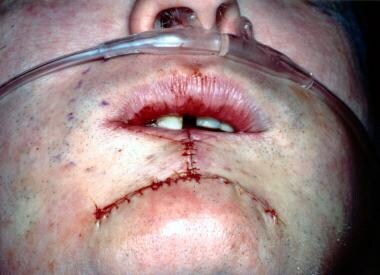 Planning for an Abbe flap from the lower lip in a patient who underwent previous bilateral cleft lip repair in which the muscle did not span the philtral segment. Insetting of an Abbe flap, with preservation of the narrow pedicle. Three-layer closure of an Abbe flap, with accurate alignment of the vermilion border. The Estlander flap is similar to the Abbe flap, but it is used to reconstruct defects that include the oral commissure (see below). This patient, who underwent previous free flap closure of a large maxillary defect, has significant scar contracture of the upper lip. Planning for an Estlander flap, an upper eyelid-to-lower eyelid musculocutaneous transposition flap, and a paramedian forehead flap to correct complications of previous free flap closure of a large maxillary defect. Close-up of the plans for an Estlander flap, with removal of a scar and oral-antral fistula caused by previous free flap closure of a large maxillary defect. 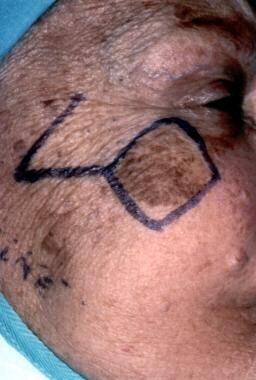 Note: Arrow demonstrates oral-cutaneous fistula. After insetting of the Estlander flap, upper eyelid-to-lower eyelid musculocutaneous transposition flap, and paramedian forehead flap. Ectropion was corrected, nasal symmetry was improved, oral cutaneous fistula was reconstructed, and upper lip contracture was released. The goal of eyelid reconstruction is to restore functional eyelids, with satisfactory protection of the globe and adequate cosmesis. The functional eyelid is composed of 2 separate lamellae: an anterior lamella that includes skin and orbicularis oculi muscle and a posterior lamella that includes the tarsal plate, orbital septum, and conjunctiva. Proper reconstruction of full-thickness defects of the eyelids requires consideration of each lamella. Full-thickness defects involving less than 25% of the eyelid may be reconstructed by using primary closure. Defects involving 25-50% of the eyelid require cantholysis. Larger defects involving the upper and lower eyelids require specialized flaps. Reconstruction in the forehead facial unit most commonly involves advancement or rotation flaps. The usual goals of preserving sensory and motor nerve function and carefully placing incisions for optimal camouflage apply here with a single exception; a meticulously executed vertical scar in the midline of the forehead that crosses the RSTLs at right angles is cosmetically acceptable. In the midline and paramedian areas of the forehead, the bellies of the frontalis muscle are dehiscent; therefore, the cephalocaudal action is minimized, and this effect ostensibly minimizes the distortion created by vertical scars in this area. The adjacent hairline and brows also offer potential hiding places for well-conceived flap incisions. Particular care must be taken with incisions around the brow so that brow asymmetry is not created with movement and contracture of surrounding tissue. Specifically, if the medial clubhead of the brow is inferiorly malpositioned, a “sinister look” can be created; secondary correction of this deformity is difficult. H-plasty is one of the most commonly used methods for closing forehead defects. 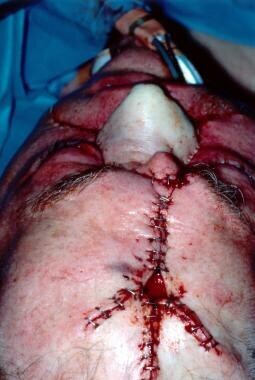 In this procedure, bilateral lateral-to-medial advancement flaps are used to close square or round defects, and the incisions are placed in existing forehead furrows (see below). Other similar repairs use the O-T, A-T, and O-Z closures, all of which are variations of bilateral advancement flaps. Diagram of bilateral advancement flaps (with the long limbs hidden in forehead furrows for forehead reconstruction). The workhorse flap for scalp reconstruction is the rotation advancement flap. Often used for central or vertex defects that measure less than 3-4 cm, 2 rotation advancement flaps, coming from opposite directions, can be used to close the defect. For larger defects, the Orticochea flap is preferred. Originally described as a 4-flap technique, Orticochea modified this several years later to a 3-flap technique, capitalizing on larger flap bases and a greater blood supply. Defects of up to 10-12 cm have been closed using this method. Reconstruction of composite defects of the face require special consideration. These commonly occur at critical junctions in the central face and involve either the eyelid/cheek/nose or the cheek/nose/lip. When considering these defects, the nose is generally reconstructed last as it “rests” on a foundation, namely the cheek and especially the upper lip. Similarly, the eyelid “rests” on the cheek, so adequate inferior cheek support for the lower eyelid reconstruction is paramount. Inbal A, Silva AK, Humphries LS, Teven CM, Gottlieb LJ. Bridging the Gap: A 20-Year Experience with Vein Grafts for Free Flap Reconstruction. The Odds for Success. Plast Reconstr Surg. 2018 Sep. 142 (3):786-94. [Medline]. Huang AT, Tarasidis G, Yelverton JC, Burke A. A novel advancement flap for reconstruction of massive forehead and temple soft-tissue defects. Laryngoscope. 2012 Aug. 122(8):1679-84. [Medline]. Barlow JO. 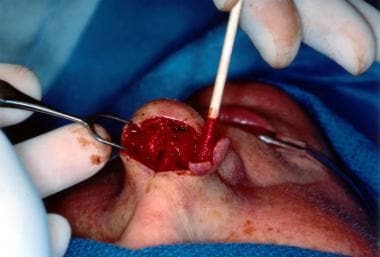 Modifying the Burow's triangles of traditional transposition flaps for the repair of adjacent nasal defects. J Am Acad Dermatol. 2010 Nov. 63(5):836-41. [Medline]. Kim JY, Chung S, Chung YK. Croissant-shaped v-y advancement flap with 2 horns for repair of small- and medium-sized facial defects. J Craniofac Surg. 2011 Sep. 22(5):1781-4. [Medline]. Prohaska J, Cook C. Flaps, Rotation. StatPearls. 2019 Jan. [Medline]. [Full Text]. Bednarek RS, Ramsey ML. Flaps, Transposition. StatPearls. 2019 Jan. [Medline]. [Full Text]. Steiger JD. 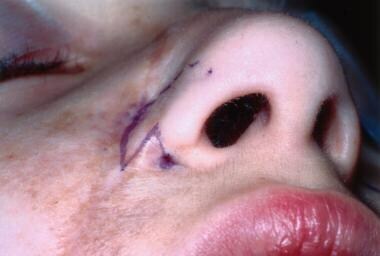 Bilobed flaps in nasal reconstruction. Facial Plast Surg Clin North Am. 2011 Feb. 19(1):107-11. [Medline]. 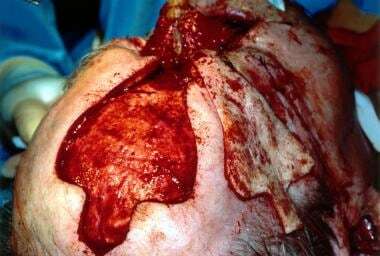 Faris C, van der Eerden P, Vuyk H. The midline central artery forehead flap: a valid alternative to supratrochlear-based forehead flaps. 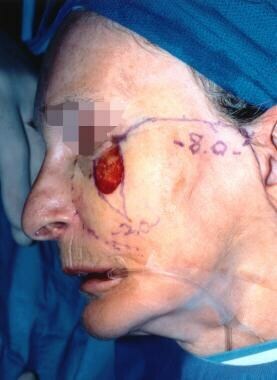 JAMA Facial Plast Surg. 2015 Jan-Feb. 17(1):16-22. [Medline]. Hussain W, Hafiji J, Salmon P. Frontalis-based island pedicle flaps for the single-stage repair of large defects of the forehead and frontal scalp. Br J Dermatol. 2012 Apr. 166(4):771-4. [Medline]. Sugg KB, Cederna PS, Brown DL. The V-Y advancement flap is equivalent to the Mustarde flap for ectropion prevention in the reconstruction of moderate-size lid-cheek junction defects. Plast Reconstr Surg. 2013 Jan. 131(1):28e-36e. [Medline]. Patel BCK, Flaharty PM, Anderson RL. Reconstruction of the eyelids. Baker SR, Swanson NA, eds. Local Flaps in Facial Reconstruction. St Louis, Mo: Mosby-Year Book, Inc; 1995. 275-303. McKelvie J, Ferguson R, Ng SGJ. 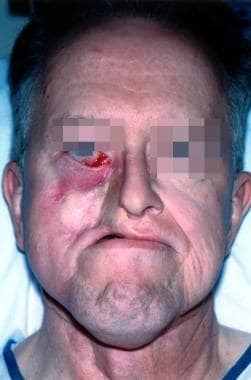 Eyelid reconstruction using the "Hughes" tarsoconjunctival advancement flap: Long-term outcomes in 122 consecutive cases over a 13-year period. Orbit. 2017 Aug. 36 (4):228-33. [Medline]. Brunetti B, Tenna S, Poccia I, Segreto F, Persichetti P. Aesthetic Reconstruction of the Frontotemporal Region: The Extended A-T Plasty, A Workhorse Revisited. Ann Plast Surg. 2017 Mar 7. [Medline]. Ogawa R. Surgery for scar revision and reduction: from primary closure to flap surgery. Burns Trauma. 2019. 7:7. [Medline]. [Full Text].